Order a Lincoln Electric Ready-Pak and get everything you need to complete a welding package all with one order number. (Packages are fully assembled.) SAE-300 HE (without Wire Feed Module) Medium Welder Trailer (K2636-1) Duo-Hitch 2 in. (51 mm) Ball/Lunette Eye Hitch (included) fender and light kit (K2639-1) cable rack (K2640-1) cable connectors - two (K2487-1) electrode cable 2/0, two 50 ft. (15.3 m) lengths (K2485-2) electrode cable 2/0, 10 ft. (3 m) (K2483-2) work cable 2/0, 50 ft. (15.3 m) (K2484-2) 300A electrode holder (K909-7) 300A work clamp (K910-1). Tbook.com crawls the web to find the best prices and availability on Welders and related Tools and Hardware products like Lincoln Electric SAE-300 HE Kubota EPA Tier 4-Engine Driven Stick Welder/Generator Ready-Pak. For this page, related items include products we find that match the following keywords: "Welder|Welding" at our vendor partner Home Depot. 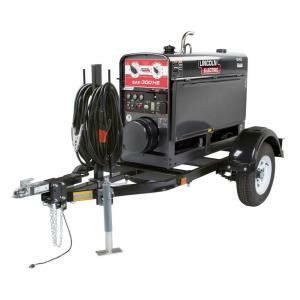 Lincoln Electric SAE-300 HE Kubota EPA Tier 4-Engine Driven Stick Welder/Generator Ready-Pak is one of 184 Welders and related products listed in the Tools and Hardware section of Tbook.com If you have any questions on this product, please give us a call at 734-971-1210 during the hours of 9am - 5pm EST for assistance. Thank you for shopping at Tbook.com, the Internet Department Store!